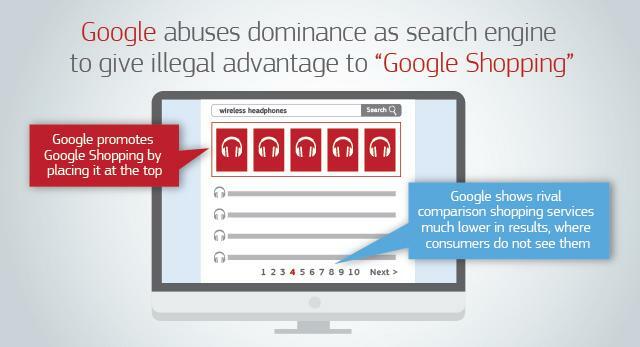 Google has abused this market dominance by giving its own comparison shopping service an illegal advantage. It gave prominent placement in its search results only to its own comparison shopping service, whilst demoting rival services. It stifled competition on the merits in comparison shopping markets.Google introduced this practice in all 13 EEA countries where Google has rolled out its comparison shopping service, starting in January 2008 in Germany and the United Kingdom. It subsequently extended the practice to France in October 2010, Italy, the Netherlands, and Spain in May 2011, the Czech Republic in February 2013 and Austria, Belgium, Denmark, Norway, Poland and Sweden in November 2013.